Dimensions (HxWxD): 3.5" x 6" x 4"
This stunning 6 inch wide natural, unpolished Black Tourmalinated Quartz Multi Point Cluster, weighing 778 grams, or 27.4 ounces or 1.7 pounds, is from Minas Gerais, Brazil from one of our favorite Brazilian suppliers who have provided us with exceptional specimens of tourmaline and tourmalinated quartz over the years. 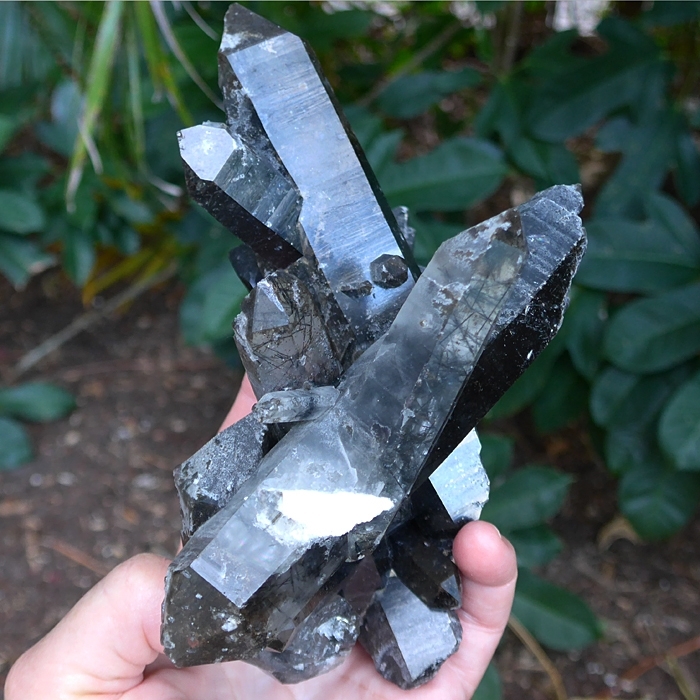 Weighing nearly two pounds, this tourmalinated quartz cluster rests on a dark rock matrix which appears to be granite pegmatite, and exhibits six large crystal points, two of which have prominent bridge crystals. The surface of the crystal points is about half coated in a black coating which may be uncrystallized tourmaline in the geological pocket of mineral soup where the tourmaline crystals formed. 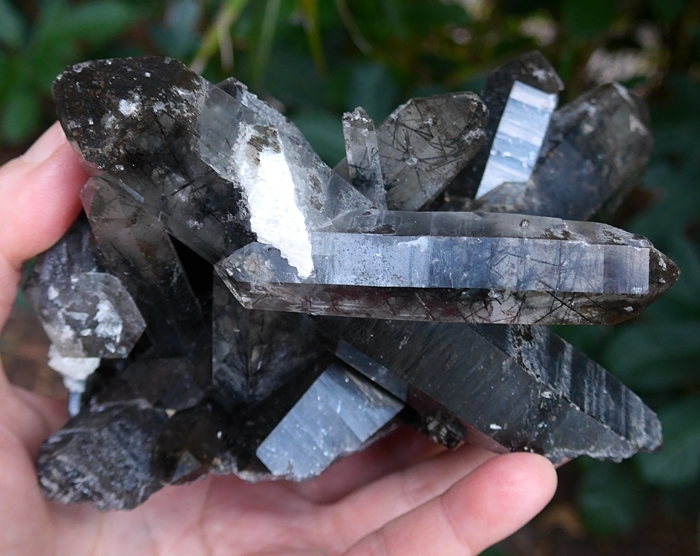 Each quartz point displays very large and thick needles of black tourmaline as well as lovely slim needles and lots of sparkling energy! Tourmalinated quartz is an excellent tool for creating focus, for clearing, cleansing and grounding. 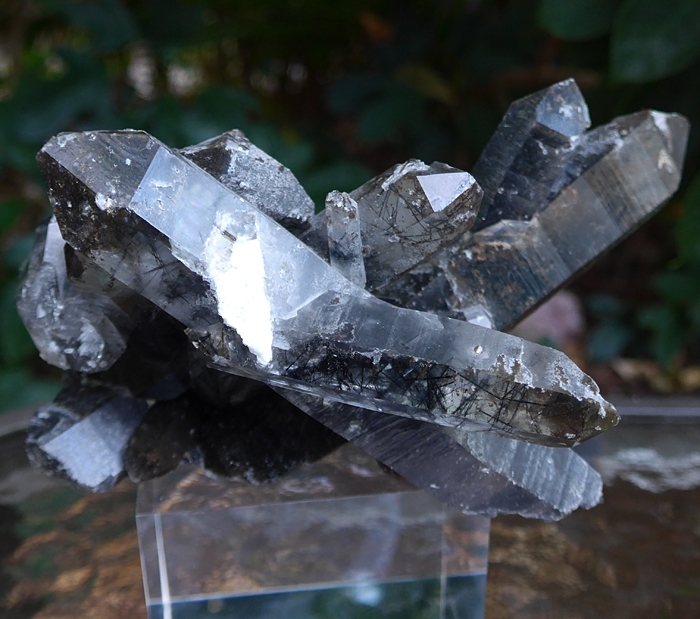 Tourmalinated quartz provides protection from negative ambient energies, sustains and vivifies the root chakra, and enhances the flow of Universal Life Force Energy throughout the human body and biofield. 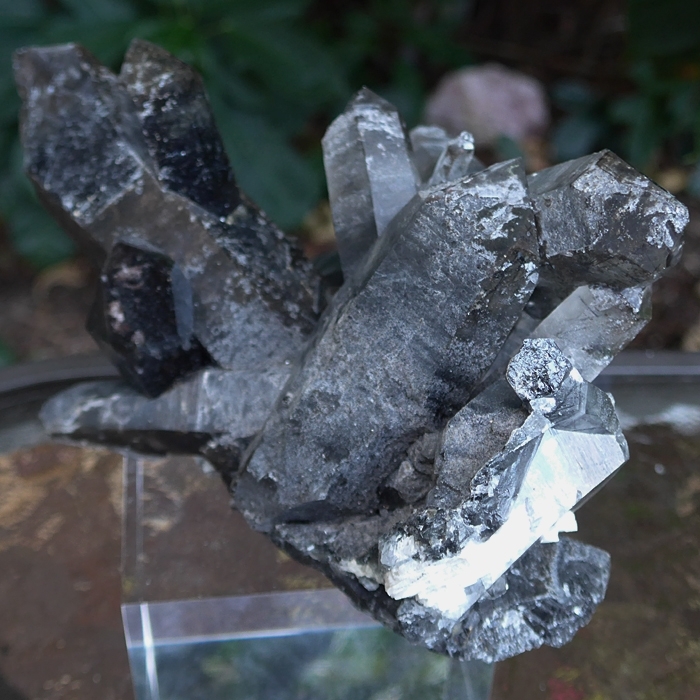 Tourmalinated quartz is the combination of quartz and black tourmaline, further balancing through the bringing together of the forces of darkness and light. This crystal is an excellent stone for protection. 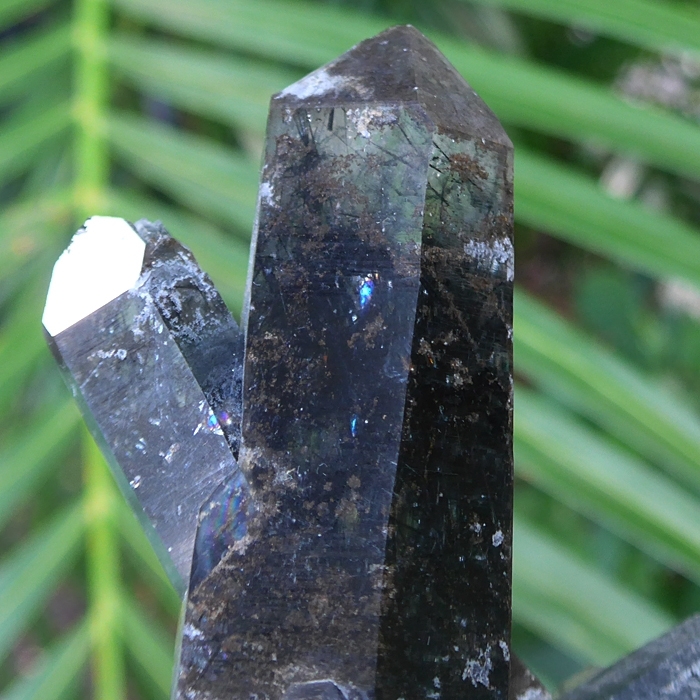 The combination of tourmaline and quartz has been used for protection from unwanted energies for centuries in shamanic and mystery school traditions alike, all over the world. 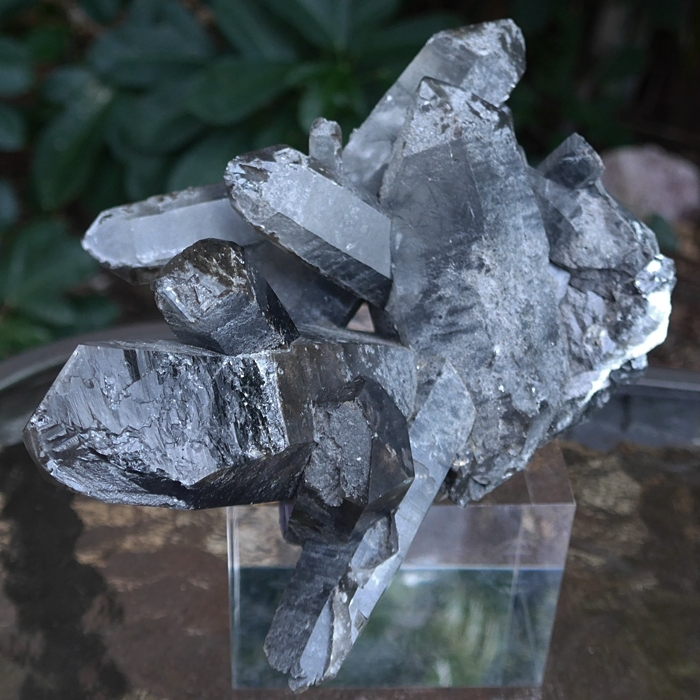 Black tourmaline helps to stimulate the flow of energy in the energy channels running up the spine, grounds us by connecting our root chakra with the earth, and can stimulate and balance the energy system in the physical body and the auric field. In this case, the tourmaline is inside of clear quartz, so it also shares the full spectrum healing properties of clear quartz. Tourmaline is the name given to a family of minerals forming hard, slender vertically striated prismatic crystals, often hexagonal, trigonal or rhombohedral in shape, with a high specific gravity, classified as complex aluminum borosilicate. Tourmaline is an igneous mineral that commonly forms in granites and granitic pegmatites. Black tourmaline provides a feeling of protection, shielding the bearer from unwanted energies in the environment, while directing energy to the root chakra, helping to ground and center the bearer, assisting in the overcoming of paranoia, low self-worth, and feelings of alienation. 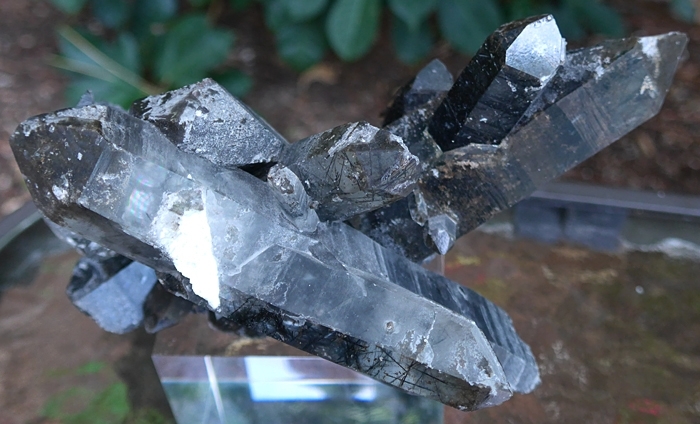 Black tourmaline helps to stimulate the flow of energy in the energy channels running up the spine, grounds us by connecting our root chakra with the Source of kundalini energy that resides in the center of the earth, and can stimulate and balance the energy system in the physical body and the auric field. We know you will use this powerful crystal with loving wisdom and respect its long journey in the Earth that has lasted for many long historical cycles. This crystal is a powerful tool, a love-gift from the Divine Mother, and should be treated with the utmost respect and appreciation. Note: weight above is shipping weight. Net weight is 778 grams, 27.4 oz. or 1.7 pounds!